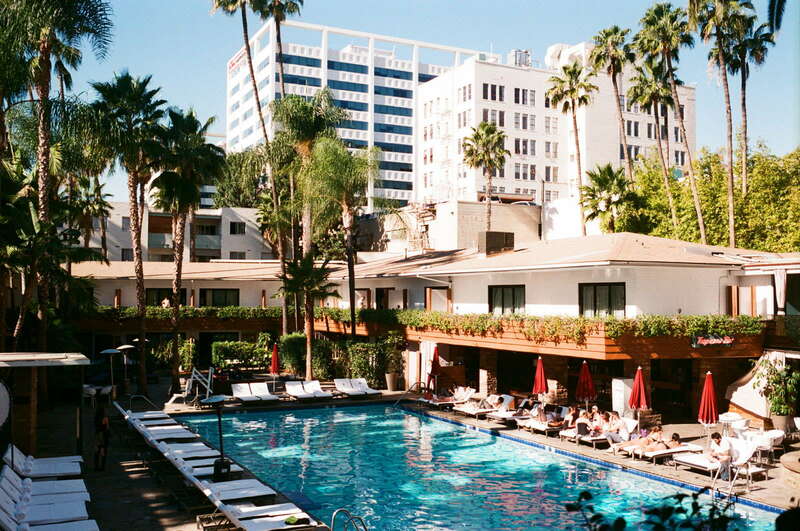 Simply put, this hotel oozes Hollywood history. Opened in 1927, the Spanish-Mediterranean hotspot was the site of the first Academy Awards. Marilyn Monroe lived here for two years before she became an icon, and Shirley Temple learned her famous stair dance here. The building is allegedly haunted by Monroe, Montgomery Clift, and Errol Flynn! Today, the hotel still hosts celebrities, but it’s just as well known for countless bars, an epic nightlife scene, and unbeatable pool parties. Guests can stay in two very different parts of the hotel. There are the Cabanas, which enclose the pool in a U-shape and have a distinctive Palm Springs vibe. 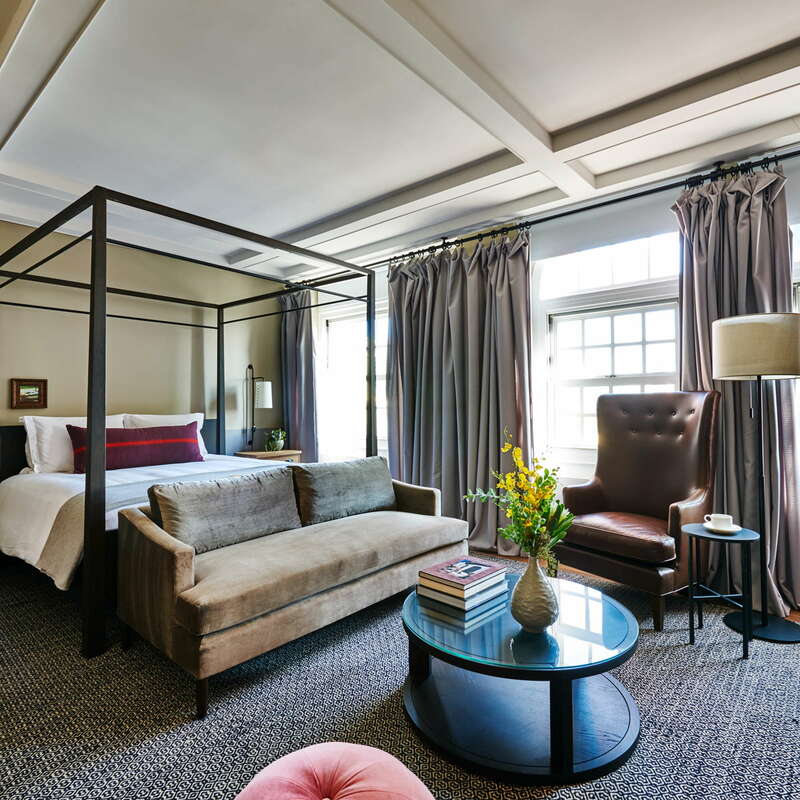 If you want to splurge on a room, request Marilyn Monroe’s former suite with its own patio, living room, dining room and raised bed with a mirror on the ceiling. 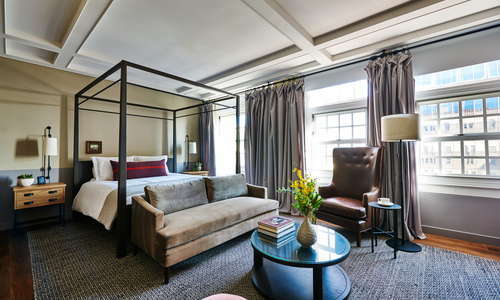 The Tower has a more traditional hotel feel but with leather lounge chairs and more modern touches. It has regular ceilings. One of the coolest rooms in the hotel is the penthouse suite. 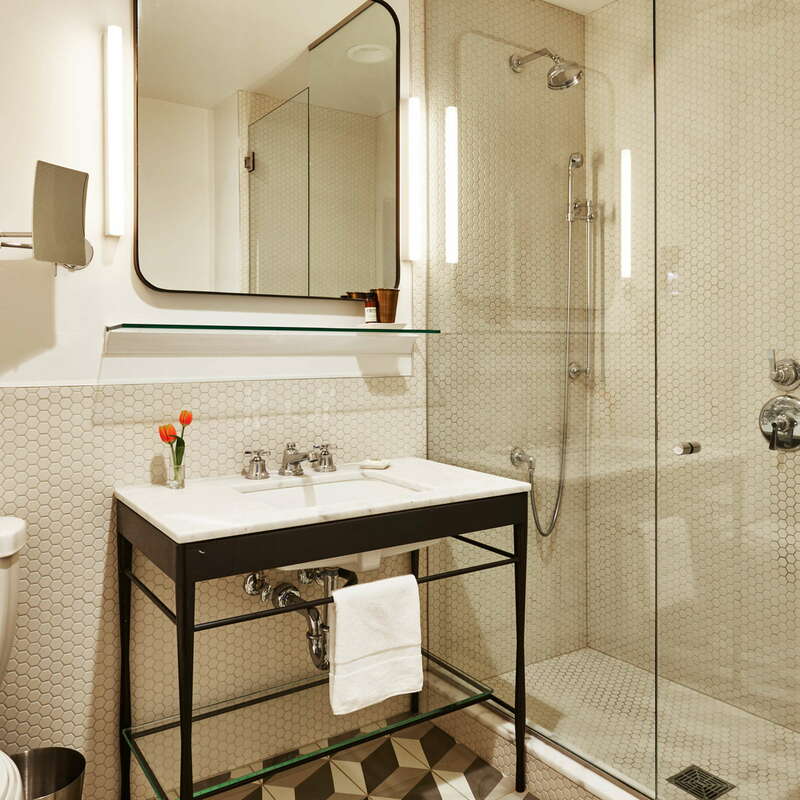 This three-level room was home to Clark Gable and Prince (at very different times), and has its own private exit to the hotel rooftop with the Roosevelt’s famous neon sign. 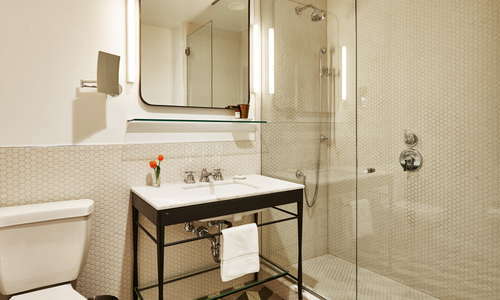 Some of the bathrooms are long and narrow with white tile and a shower in the back. The hotel features Momo bath products. Considered to be the heart of the building, the lobby here is the hub of all activity that surrounds the hotel. High ceilings with sweeping chandeliers hang over an ornate fountain and black and brown leather sofas. Multiple bars can be found in the corners and the hotel restaurant Public Kitchen is off to one side. The hotel is the site of many Hollywood Premiere after-parties. If you stick around the lobby, you never know who you might run into. 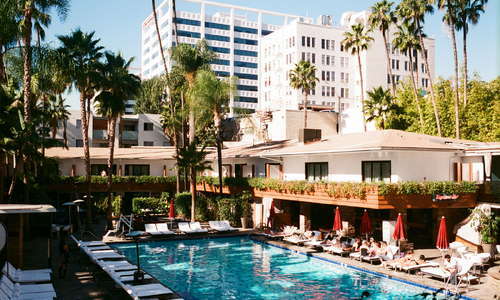 The Roosevelt pool is well-known for its social scene. Each Sunday is their legendary DJ-led pool party. Thursday nights are NightSwim, known for famous DJs. They're really into DJs here. YOU SHOULD KNOW The hotel hosts a lot of events and parties, so if you’re coming to enjoy the pool, it’s best to call ahead and make sure you’re even allowed to be there. While there isn't a traditional spa, there is a massage garden outside that can accommodate four people at a time. A small fitness center provides guests with standard cardio machines and free weights. There are multiple dining options at the Roosevelt including 25 Degrees, a luxury diner that’s open 24/7 and serves spiked milk shakes. Public Kitchen is a more refined lunch and dinner option, and Tropicana Pool Café dishes out sandwiches and salads. YOU SHOULD KNOW 25 Degrees says it's open 24/7, but sometimes closes early on Sunday nights (around 9pm). Known for its nightlife, there is no shortage of options for drinking and dancing here. On the second floor is Spare Room--aptly named for the two bowling lanes inside the bar. The Tropicana Bar by the pool is always packed for NightSwim. Two bars in the lobby include the Library Bar with exquisite craft cocktails, and the bar at Public Kitchen that wraps around inside the restaurant. There’s a beer garden out by the pool with tacos, beer and ping-pong. 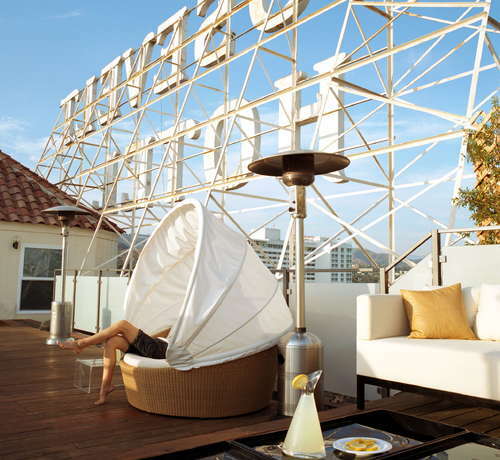 And finally, there’s Beacher’s Madhouse, which only can be described as the craziest night you’ll ever have in LA. Next to the reception area, there’s often a bottle service cart that is rolled out from 4:30-7:30pm and guests can drink for free on a variety of pre-made cocktails. Hollywood is a very walkable area--especially along the Hollywood Walk of Fame--but cabs and ride apps like Uber or Lyft are everywhere. If you want to head to Universal Studios, Santa Monica or Downtown LA, there’s the Hollywood/Highland Train Station (3-minute walk) practically across the street. Hollywood is chock-full of restaurant options, but if you want to continue down the road of Hollywood history, check out Musso & Frank Grill (7-minute walk) which has been serving up steaks since 1919. For good sushi and great people-watching, head to Katsuya Hollywood (4-minute drive). There is an endless supply of bars and clubs in Hollywood that come and go every six months. The newest club is Avenue (10-minute drive), which is the latest in a line of New York club transplants. If one of the 10 bars in the hotel isn’t enough, Cabo Cantina Hollywood (7-minute walk) is always a fun party with great happy hour specials and cheap tacos. 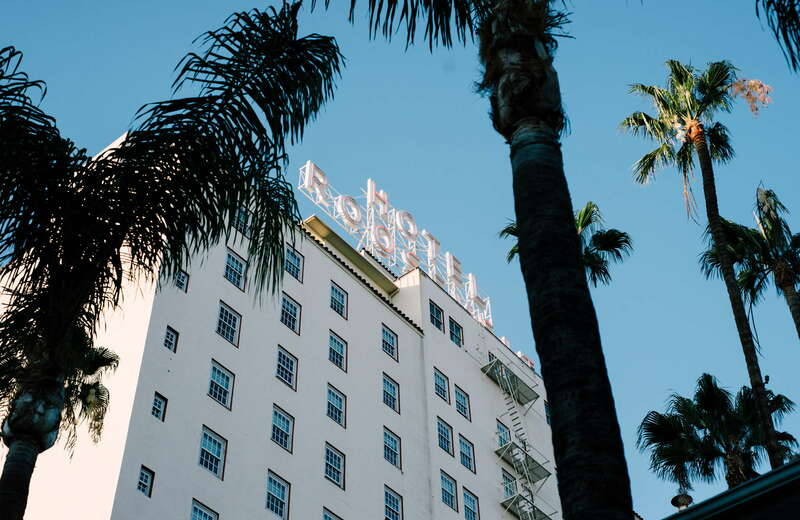 For Hollywood history-buffs, there’s not much in town that compares to the Roosevelt. And for social-life lovers, there’s no hotel that compares, either. Being in the middle of Hollywood has its ups and downs--there’s never a shortage of things to do, see, buy, eat or drink. But there’s also thousands of people strolling the streets, some in costume, some just taking selfies at all hours of the day. The hotel is a very cool place to party, but with that also comes noise issues (despite their noise-proofing efforts). Overall, if you’re coming to town for fun, drinks, food, a little history and great nightlife, you’re going to love the Roosevelt.